What I love about Mexican cuisine is that the ingredients, used in this North American country, are so similar, to popular ingredients in the Indian sub continent's cuisine. Both tomatoes and jalapeños were domesticated in and are indigenous to Mexico. Tomatoes are blundered in some controversy though. Some say they are indigenous to Western South America from Ecuador to Northern Chile and Galapagos Islands. Some believe they were cultivated first in Peru and others believe in Mexico. However, there are no controversies attached to the origin of jalapeño. I know Cinco de Mayo has come and gone, but I have meant to post this easy recipe for years now. Especially after a reader requested my version on Food Wanderings' Facebook page. The timing could not have been better as early summer BBQs are already in full swing with this pleasant spring weather, not to mention graduation parties and end of the season sports dinners, just to name a few. I have been making this version for years now, as a condiment, especially for soccer team dinners where Jonathan grills outdoors the beef and chicken I marinate overnight for fajitas. In the last three years, now that S is in college, we brought Mexican catering a la Madnicks up to PA, where S's UMASS club soccer team travels to a tournament each year. I use Roma tomatoes. They have a sweet undertone. Some jalapeños are spicier than others. This time I roasted four, they were surprisingly pretty mild. Use caution though, you might need only one or two, depending on how fiery they are and your tolerance, or lack thereof, to heat. As I always say, adjust and make this recipe your own. 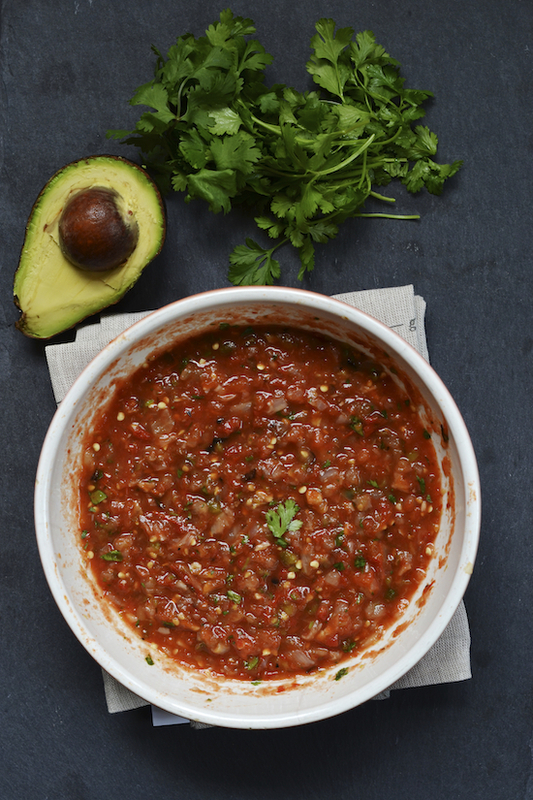 This is a great make ahead salsa. It tastes better cooled after being refrigerated overnight at the least. The salsa keeps refrigerated, in an airtight container, for up to a week. Turn on the broil setting on your oven. Line a large roasting pan with foil and spread the tomatoes, jalapeños and onion on the pan. Roast for few minutes until charred on one side and flip with a large stainless steel spatula. Roast for a couple of minutes longer and take the jalapeños out as they will roast quicker. Continue roasting the tomatoes and onions for a few minutes longer. Take out of the oven and let cool. Stem jalapeños and slice the stem side off of the tomatoes. Add the onions and garlic to the food processor and whizz to a very rough chop. Add the tomatoes and jalapeños and give a couple quick pulses. Add the cilantro and give an additional couple of pulses until the desired consistency is reached. Add lime and salt to taste and refrigerate overnight. If you do not like charred skin you can peel the tomatoes and jalapeños prior to whizzing them in the food processor. If you choose you don't have to roast the vegetables at all or roast just the ones you wish to. I sometimes make this salsa raw. Just adding all the ingredients into the food processor and pulse to the desired consistency. A rasry salsa! I am a sucker for anything Mexican. This salsa looks fab! Does the smokey flavor come from the charred jalapeno? Hi Tony, TY. Yep. Though, it is surprisingly subtle. Any condiment recipe with roasted tomatoes has my attention. You roasted everything Shulie! I can´t imagine how good this is. This is the kind of stuff that I would use on everything, especially during grilling season, which for me is year round...! TY. You do, Laura?! We used to years ago but not any more for some reason. Lip smacking good. I d never stop eating the salsa if made this way! TY Anusha. It is addictive. Especially as it marinades over time. I do something very similar only I add a few chopped chipotles. Salsa is one thing our house can never have enough of! Can't wait to start grilling! nice presentation.. delectable n delicious..
TY PT. Have a great weekend. אני גם אוהבת אוכל מקסיקני אותו למדתי להכיר כשחיינו בלוס אנגלס. שולי - עוד כמה ימים חל חג השבועות, אז אני מאחלת לך חודש טוב (חודש סיוון שהתחיל) וחג שבועות שמח לך ולכל משפחתך! ממש להפתעתי הרבה וויני הפלפל הפעם לא הייה חריף בכלל. ממש מפתיע. בהחלט פיקנטי בלי החריפות. חג שבועות גם לך ולמשפחתך. I love the idea of roasting/charring the tomatoes before making them into salsa for a change of pace. This salsa looks amazing, Shulie! This salsa is just the kind of thing I love!! I also LOOOOOVE this photo! The mood, the colors, the styling... beautiful. Hi Kate, TY. I keep studying this photo. No worries. At first I thought I just didn't know the word. :) Happens to me all the time. You write so beautifully, Shulie...with the food to match! What a gorgeous salsa...perfect for the upcoming Memorial Day weekend. Hope you had a wonderful Mother's Day!!! TY Liz. Wow Memorial Day is around the corner. Time in 2013 flies. I love your salsa. It's perfect for getting me ready for a wonderful Mexican meal. I can't wait to hear more about what you're writing...but in the meantime, I'll be satisfied by this gorgeous salsa. Thank you for sharing the recipe. I love experimenting with new salsa combos. I hope you are doing well! I so love this and I know my kids would devour it. Dear Shulie, I've been looking for a great tomato salsa recipe for years... I think this is a winner!